We are interested in how reactive nitrogen oxides, namely the nighttime species N2O5, heterogeneously react on aerosols. While this reaction has been well-characterized on model inorganic aerosol systems, the ability of organic compounds to impact this reaction has remained elusive yet are important since organics can constitute a large fraction of the submicron aerosol mass fraction. Using model inorganic/organic mixture, we aim to characterize how organic compounds impact the uptake of N2O5 on aerosols. One important consideration is the ability of different organic compounds to form coatings around the inorganic component of the aerosol and alter phase transitions that occur during water uptake when particles can transition from crystalline solids to deliquesced solutions or during water loss when particles transition back to crystalline solids. 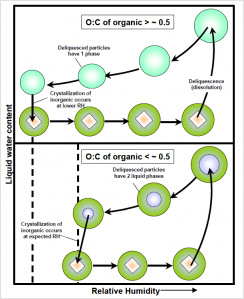 Depending on the chemical properties of the organics, namely the solubility which is determined in part by the oxygen to carbon ratio (O:C), certain organics will deliquesce with the inorganic compounds to form a mixed solution while other organics can undergo phase separation from inorganic compounds during deliquescence causing the formation of two distinct phases within the particle as shown in the figure below. The ability of organics to affect particle phase is thought to play a key role in determining how organics affect the uptake of N2O5 onto ambient aerosols and is currently being investigated via laboratory experiments in the Thornton group. Influence of the O:C ratio of organic compounds on phase transitions of inorganic/organic aerosols.